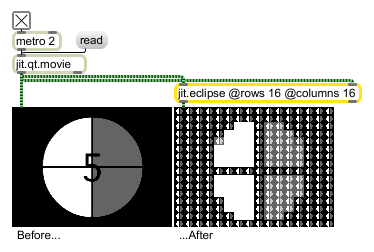 The jit.eclipse object performs meta-imaging on two 4-plane char input matrices. A jit.eclipse object divides a matrix sent into the left inlet into a grid with a specified number of rows and columns. Each box in the grid contains a scaled-down representation of the overall matrix. Each box is then tinted so that the overall image resembles a second matrix (sent into the right inlet). If the same image is used in both inputs, the result is a self-similar (or meta-) image. Additional features such as threshold inversion, scalar tinting, and a choice of additive or multiplicative tinting are supported. There are also four modes that switch between color and monochrome treatment of the two matrices. inv int Invert color flag (default = 0) When the flag is set, RGB attributes are inverted in regions of the output image that are inverted. tint int Tint mode flag (default = 1) When the flag is set, tinting is based on the second input matrix.